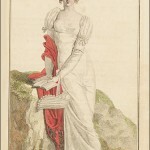 La Belle Assemblée, June 1808. This publication was just over 2 years old and still offering prints showing 2 or 3 figures in either colored or black-and-white versions, depending on how much you paid for the magazine. By 1809, the single figure print became the norm. Note that the parasols are held by the top point and not the handle. A majority of my prints show parasols held in this manner, with a loop or ribbon tie attached to the point. “No. 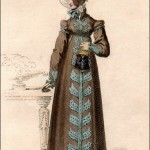 1 [left]: A plain cambric, or jaconet muslin dress, made a walking length; scalloped at the feet and wrist, with high gored bosom, and long sleeves of net. A spencer of silver lilac sarsnet, with bosom and cuffs ornamented à-la-Militaire. Simple turban bonnet, composed of the same material as the spencer. The hair in alternate bands and ringlets. Gloves and shoes of lemon-coloured kid; and parasol of shaded green sarsnet. It is well to observe that with this kind of bonnet is usually worn a short veil of white lace, suspended from the edge next the hair. “No. 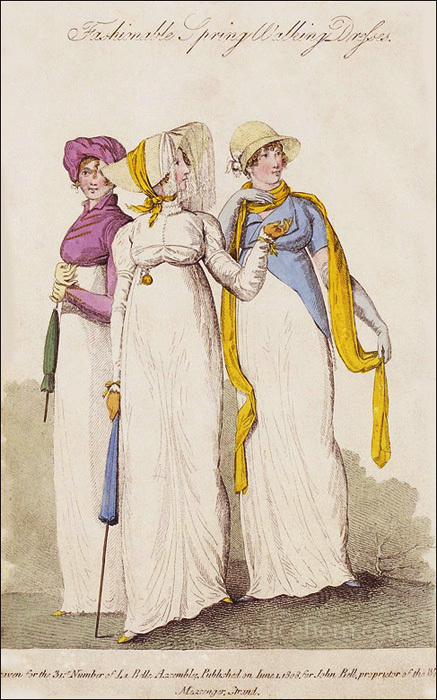 2 [center]: A light dress of blossom-coloured muslin over white cambric, with waistcoat bosom, and deep scalloped collar and cuffs. A large gipsy hat of straw, or imperial chip, tied across the crown with a silk handkerchief, of the same shade, or one of white brocade sarsnet. A veil of Mecklin lace, thrown negligently over the front of the hat, so as agreeably to shade the countenance. Small French watch, worn on the outside. Shoes of purple kid, or olive jean. Gloves of York tan. Brown, green, or purple parasol, with a deep fringed awning.